TIP 1: Add 2 - 3 drops of lemon oil into your glass of water (hot or cold) or protein shake for flavor and to help purify your water from the yuckies that are often in our water supply, and aid your weight loss efforts. 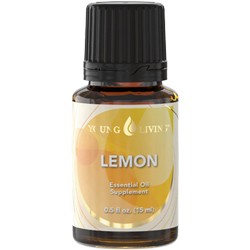 TIP 2: Diffuse lemon oil into the air for a fresh scent, to energize, to boost mental clarity, and combat depression! TIP 3: Add 5 drops of lemon oil to a 4 oz (glass) spray bottle to use to clean your home with since lemon oil has strong antibacterial, antifungal and antiviral properties! TIP 4: Put several drops in an empty capsule and swallow - it's rich in limonene which over 50 clinical studies have shown to successfully combat tumor growth! TIP 5: If you are fighting a throat infection or tonsillitis, diffuse in your room, massage it onto your throat or gargle with lemon oil and sea salt in a glass of warm water. BONUS TIP: Sticky stuff, like gum stuck in your child's hair, grease, crayons in the carpet? Try putting a few drops of lemon oil on the sticky stuff and work it in. The gum will begin to dissolve and can then be washed out of the hair. This also works for removing the gummy residue from some of those sticky price tags or labels on glass. PROPERTIES of Lemon include: antitumoral, antifungal, antibacterial, antiviral, astringent, anti-inflammatory, immune stimulant, diuretic, digestive, expectorant, calming.